Prochazka Custom Guitars offer two different types of Electric Upright Bass in 4 or 5 string version. 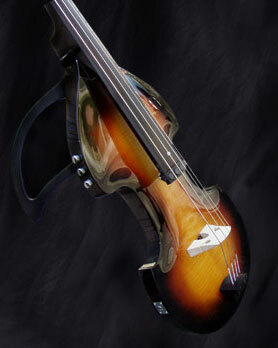 The first is Standard model - more description and photos - link below - Electric Upright Bass. Second is enlarged variation of Standard model. Scales and important ergonomic parts are made equivalent to the 3/4 or 4/4 acoustic double bass. There are two birchen rests for more comfortable playing and for acoustic double bass body simulation. Rests are easily dismountable. Telescopic end pin is made from carbon fibre. Electronics: There are two pickup system variants - piezo and magnetic. Piezo: Under bridge piezo elements combined with 9V or 18V active. Magnetic: Prochazka Custom Guitars Magnetic Pickup mounted in fingerboard. There are four ( or five ) separate coils, individually adjustable for optimum string balance. Magnetic pickup can be used as independent pickup or as pickup combined with piezo pickup. In case of using both pickups there is active mix with adjustable input sensitivity installed to guarantee balance between pickups with different impedance. Magnetic pickup works with bass guitar effect very well. System can be combined with 2 or 3 bands EQ. Electric upright bass is designed for bow or finger playing and it is absolutely resistant to feedback.